Dante Alighieri (1265-1321), is widely regarded as one of the greatest poets in the Western literary tradition. He is so famous that he is simply known by his first name, Dante and he is held to be the national poet of Italy. This literary giant had a decisive impact on the development not only of Italian literature but on many other aspects of the Renaissance. He made a significant contribution to the early Renaissance and many of his ideas and themes were developed by later writers, artists, and thinkers. Dante contributed to the development of humanism, the use of the vernacular in literature and challenged the hegemonic nature of the Church and these helped to generate the cultural and intellectual changes known as the Renaissance, which transformed the world forever. The poet was born into one of the leading families in Florence. His mother died when he was twelve and he was contracted while still a young boy in marriage to a girl who belonged to another leading family. At some time, he saw and fell in love with a young girl called Beatrice and she was the love of his life and became his muse. Dante married Gemma Donati, but he remained in love with Beatrice even after her untimely death. The death of his beloved led to the poet studying philosophy and theology, as he sought some meaning in life. Dante like his family belonged to one of the main factions in the city whose politics was often bloody. Florence was divided between the pro-Imperial Ghibellines and those who supported the Papacy known as the Guelfs. The origin of this dispute lay in the various conflicts between the Holy Roman Emperor and the Pope. The poet fought at the Battle of Campaldino (1289) when the city’s Guelph faction defeated the Arezzo Ghibellines. After the victory the Guelph factions changed the constitution and Dante had to enroll in a Guild, an association of tradesmen to remain a citizen . However as was typical of the fractious politics in Late Medieval Italy, the Guelphs soon divided on ideological lines, and they became two mutually hostile factions the White and Black Guelphs. The White Guelphs, the party of Dante eventually expelled their former allies and colleagues. However, the Whites returned with the support of Charles Valois and ousted the Black faction from the government of the city, and this led to the exiling of many prominent Florentines . Dante was exiled because of trumped up charges of corruption. Dante could have returned to his native city if he swore an oath to the Whites and paid a fine. He refused to do both, and this was typical of the poet who was a man of great integrity. Moreover, he was party to several attempts to expel the Black Guelphs’ but these were all failures. Dante was now an exile and he was forced to wander Italy and possibly beyond and he was dependent on the generosity of powerful nobles. In 1306 he was in Bologna but was later forced to leave with the other Florentine exiles. It seems that he ended up in Padua and after this, he may have visited Paris. Dante found exile very hard and he wrote ‘how hard a path it is for one who goes ascending and descending others' stairs’’ . It was during his period of exile that he was able to concentrate on his poetry and prose works. Despite his literary efforts he remained active both as a politician and a diplomat and he was tireless in his efforts to return to his beloved Florence. All his endeavors to return to his believed home were thwarted. Dante accepted an invitation from the ruler of Ravenna to stay in that city. Here the poet finished the last of his great works and he died in 1321 . He was buried with great honors in Ravenna and his remains have not been returned to his native Florence. The Florentine’s first great work was La Vita Nova (The New Life) which is a series of poems and short prose pieces related to his beloved Beatrice. He also wrote the Banquet a series of longer poems. 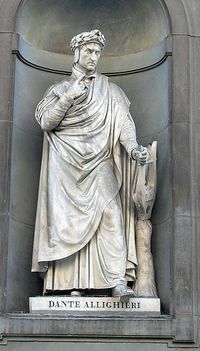 Dante was also a great prose writer and he wrote the unfinished De vulgar eloquent ("On the Eloquence of Vernacular"), which argued for the development of an Italian literary language. Dante also wrote an important political treatise known as De Monarchia in Latin. This was a radical work for the time and the Florentine exile argued for a Universal Monarchy and the separation of Church and state. In this treatise, the poet argued against the temporal authority of the Papacy. This was deemed to be heretical by many in the Church and indeed during the Counter-Reformation, this work was banned by the Papacy. Dante’s greatest work and indeed one of the greatest in the Western canon is the Divine Comedy. This is an epic poem that is divided into three parts and is composed of 100 cantos. The Comedy is an imagined account of Dante’s journey in the Christian afterlife. This work is divided into the Inferno which depicts hell, then Purgatorio which details Purgatory and the final section is concerned with Heaven (Paradiso). This is a very allegorical work and the poem represents the soul's journey towards God. In the epic, Dante is guided by the ‘shade’ or spirit of the great Roman poet Virgil . The epic is an attempt to demonstrate how humans can become aligned to the love of God, which is seen as the fundamental force in the Universe. The epic made Dante immediately famous and a revered figure even before his death in 1321. One of the distinctive features of Middle Age culture was that Latin was considered to be the only language suitable for literary and philosophical works. Dante believed that the vernacular languages were valid vehicles for literary expression. The poet believed that the vernacular was suitable for certain genres such as comedy, poetry and prose . This was a very radical proposal at the time and was very influential in later centuries. In his great work the Divine Comedy, the Florentine exile wrote the cantos in Tuscan but with borrowings from other Italian regional dialects and even Latin. The use of Tuscan persuaded other great writers such as Petrarch and Boccaccio to write in this dialect of Italian . Dante’s great work helped to make Tuscan the literary language of Italy and persuaded many writers and poets to abandon Latin and to write in their native tongue. The Florentine exile decisively influenced the Renaissance not only in Italy but in the rest of Europe. Dante’s great poetry demonstrated that literary works could be written in the vernacular. As a result, the vast majority of Renaissance writers in Italy and beyond wrote in their native tongues. This was to have consequences that went far beyond the literary world. The language of Dante became the official language of many Italian states and it helped to develop a national consciousness during the High Renaissance in particular, which is evident in the works of Machiavelli. Dante was a literary giant and he was a decisive impact on succeeding Italian Renaissance writers. He was a great admirer of the Sicilian School and he helped to popularize their most important style of verse, the sonnet. Dante himself wrote many great sonnets often on the subject of his beloved Beatrice . This was an influence on many of the Renaissance great sonneteers such as Petrarch, who had a love-hate relationship with his great predecessor. 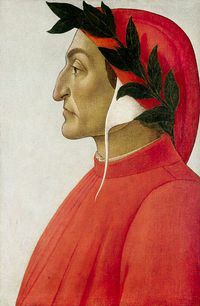 Dante also helped to popularize the themes of Provencal poetry in Italy. This was poetry that was written in what is now Provence in south-west France. Provencal troubadours celebrated chivalry and especially courtly love, a highly manners style of poetry that celebrates an unattainable beloved and this was very influential in Renaissance in Italy. Dante’s work did much to spread the ideas of ‘courtly love’ across Europe form the 14th to the 16th century. The issuance of the Divine Comedy is often seen as the beginning of the Renaissance and the end of the Late Medieval Period in Italy. This is despite the fact that the subject of the great epic is religion and salvation, which seems contrary to the spirit of the Renaissance which extolled the pleasures of this world and the individual. Dante did not believe that this world was an antechamber to the next world but had its own value and merits. Unlike conventional Christian morality, he did not think that it was wrong to be happy and to enjoy this life. The great poet did not believe that eternal salvation and earthly happiness were incompatible. Dante also argued that it was necessary for a person to contribute to civic and political life and it was indeed virtuous. This idea proved to be very influential upon later humanists, who played a crucial role in the development of the Renaissance . The exiled Florentine was a great religious poet and theologian. His conception of the dual nature of man, one that was earthly and the other that was eternal was decisive in the development of his political doctrine. He argued in his main political work that there should be a separation of church and state. This was something that greatly contributed to Renaissance political thought. Major thinkers such as Machiavelli under the influence of the great Florentine believed that religion had no place in politics and that politics was a skill and should not be constrained by theological precepts. Dante while a deeply religious man by arguing that church and state should be separate did much to ensure that the humanists who succeeded him felt free to concentrate on the secular and did not feel that it was incompatible with their hopes of future salvation. 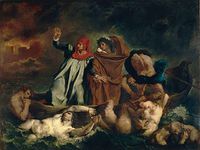 The ideas of Dante not only influenced Renaissance thinkers but also some of the leaders of the Reformation. The exiled Florentine helped to change the discourse on the role of religion in Europe . Dante composed one of the great literary work in Italian if not all literature. His Divine Comedy is an enduring literary masterpiece that has and will stand the test of time. However, the Florentine was much more than a great poet and he made a significant contribution to the Renaissance. His helped to fashion the poetry of the period and decisively changed the direction of Western literature. Dante helped to raise the Tuscan dialect into the national literary language of Italy. He helped to establish vernacular languages as literary languages and demonstrated that great writers did not have to use Latin, and this is perhaps his greatest contribution to the Renaissance. Dante was a forerunner of the humanist movement, because he argues that this life had value and that the individual while a part of the community was significant and had a right to self-expression and even happiness. The poet was also an original political and religious thinker and he argued for the then dangerous idea of a separation of church and state. This persuaded many humanists to adopt a more secular approach that was such a feature of civic humanism. However, it should be noted that the Florentine was also medieval in outlook and he would have disapproved of some of the aspects of the Renaissance in the 15-16th century. Dante can be considered because of his immense contributions one of founders of the Renaissance. Fortin, Ernest L. Dissent and Philosophy in the Middle Ages: Dante and his precursors. (Leington, Lexington Books, 2002). Gardiner, Eileen, ed. Visions of heaven and hell before Dante (New York: Italica Press, 1989). Keen, Catherine. Dante and the City (London, Tempus, 2003). Dante. Divine Comedy translated by Frank Musa (London, Penguin Books, 1987, 3 vols).